Humans are an adaptable species, facilitated by wondrous minds that are able to invent or discover ways of making life easier. From historical discoveries like how to create fire, to modern inventions like vaccines, we are hardwired to overcome threats to survival. Technology might be considered by some to be the defining difference between human and animal. In modern society, ‘the market’ is credited for advancements, inspired by the basic tenants of need and supply. If humanity has a need for it, the market will endeavour to provide a marketable solution thanks to research and development investments around the world. A crisis that has affected almost every country on the planet is the overabundance of waste. 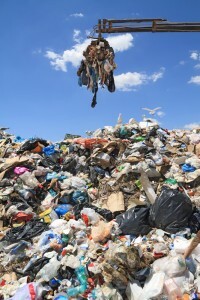 Landfills are dangerously close to capacity, and we are running out of options. Although textile waste only accounts for approximately 12% of global waste volume, many countries, especially in Europe have made banning textiles from landfills an absolute priority, and for good reason. Organic textile waste in a landfill is prone to mould that is highly flammable and can self ignite. Textiles can take a century to decompose, and synthetic fibres don’t decompose at all. It’s cumulative volume. Chemicals and dyes in the fibres leach toxins in the ground and air, contaminating ground water. It also releases those awful carbon emissions you hear so much about lately. It’s a shame to have textiles in landfills knowing all this, especially because textile waste is a very valuable resource (as is all waste) that can be used to create a multitude of things the market is happy to support. 98% of all textile waste is recyclable, yet Canadians only recycle 25% of their textile waste. Sadly, Canada lags far far behind many other nations, especially in Europe when it comes to textile waste management. San Francisco has just launched an assertive plan to have textiles banned from landfills by 2020, and they aren’t the only city launching such an initiative. We applaud them for furthering this trend in North America! We should all be so wise! TWD is committed to investing in the implementation of a local textile waste management system that will maximize the fundraising potential for our charity clients, and also help contribute to a local green tech solution that will enable Ontario to send no textile waste to landfill. TWD’s new Product Development division is looking forward to making an announcement later this year.